Savvy consumers interview a few different financial advisors to learn more about each one’s background, experience, specialties, and target clientele, as well as his or her listening skills and communication styles. When seeking a financial advisor, first send the Financial Advisor Interview Questionnaire included here, review each advisor’s responses, and then visit with two or three prospective advisors over the telephone. After you’ve identified those advisors who may best fit your needs, ask for a no-obligation get-acquainted meeting and meet with them in person before you make a commitment or sign any contracts. 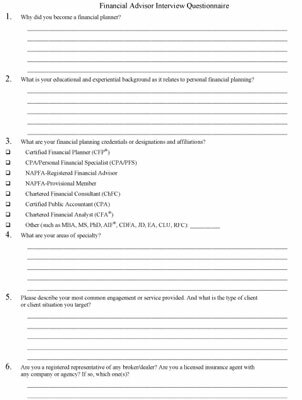 Click here to download and print the Financial Advisor Interview Questionnaire. This questionnaire is designed to help you get to know a lot more about a prospective financial advisor prior to meeting with him or speaking with him on the telephone. If an advisor refuses to complete this questionnaire, that says a lot about his attitude or his schedule. In that event, continue on with other advisors who will comply with this request. Some of the most revealing things you can find out about a financial advisor have to do with why he got into financial planning or advisory services in the first place. You may want to find an individual who has a sincere and deep passion to serve. Many financial advisors have personally lived through life events that you may be experiencing, and their personal insight could be extremely valuable to you. Another key question isn’t just how an advisor is compensated, but how much that advisor will be compensated if you are to work with him. You can’t compare advisors’ services and prices without getting this kind of detail. And don’t forget about conflicts of interest related to compensation. If an advisor makes $1,000 recommending one strategy or investment and $5,000 recommending another, there is a conflict of interest. Many financial advisors, especially independent, veteran advisors and fee-only advisors, require minimums. Those minimums may be the size of your investment account, your income or net worth, or the annual revenues you generate for the advisor. If you’re a do-it-yourselfer or you’re looking for a second opinion or one-time review, you very likely won’t qualify for many of these advisors’ minimum requirements. Will the prospective advisor be proud and honored to have you as a client? If you happen to be someone who just barely makes an advisor’s minimum requirements, or the advisor must make special arrangements or waive minimums to accommodate you, sooner or later, you may find that you aren’t getting the attention and personal service that you need and deserve. Be sure to obtain a written contract from the advisor you select, outlining exactly what the financial advisor will provide for you, how much the services will cost in total, what you must provide to get this work completed, and when you will receive the final product.